The non surgical rhinoplasty (or nose fillers) is a real favourite of ours. 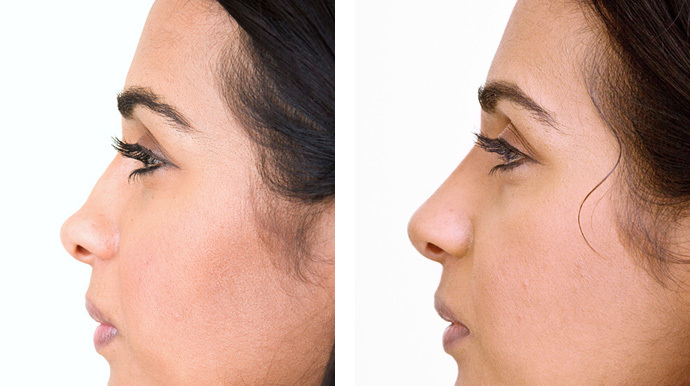 This is one of our signature WOW factor procedures, as it magically reshapes noses, without the need for a scalpel. The non surgical nose shaping treatment takes only 5 minutes to perform, with no pain or side-effects and great results. With this procedure, we can do many things. We can correct imperfections after a surgical rhinoplasty, we can straighten injured noses and we can even build up and shape noses in Asian and Afro-caribbean patients who want to have bigger more European looking noses. All of these 3 applications are performed by a careful injection of hyaluronic acid nose fillers such as restylane, and we favour the nose fillers with bigger particles such as Perlane and Juvederm ultra 4. The results of our non surgical nose jobs are long lasting, up to 12-18 months. The most wonderful application of these non-surgical nose shaping techniques however, is definitely that in many cases we can replicate the surgical procedure alternative, by straightening the nose, evening out the dorsal hump, lifting the tip of the nose, changing the shape of the nostrils, and optically we can even make the nose look smaller. All via a non-surgical nose shaping procedure, utilising non surgical nose shaping and correction techniques. Of course, not all patients are suitable, but this modern cutting edge technique now provides a great alternative to all those who would never consider an operation. How do non surgical nose shaping work? 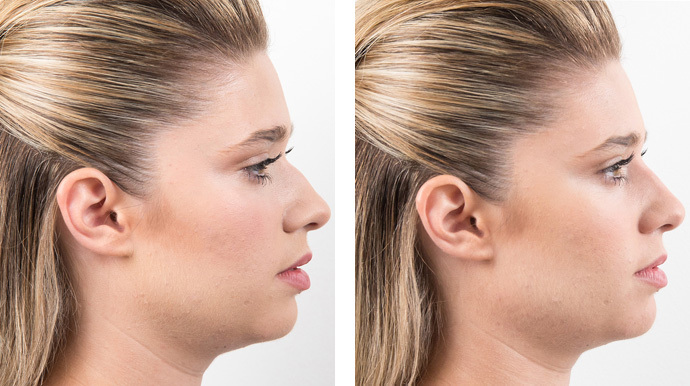 Great expertise is needed with this procedure, but by carefully injecting dermal filler above and below the “bump” on the nose, we can very easily make the most “hooked” of noses, look completely straight. Additionally, by applying filler around the tip of the nose, we can make it look thinner and more refined, and can further lift the tip of the nose by injecting botox into the depressor nasalis, the muscle which continuously pulls the nose down. After around 4000 thousand cases which we have performed we are still amazed each time with the possibilities of this procedure. 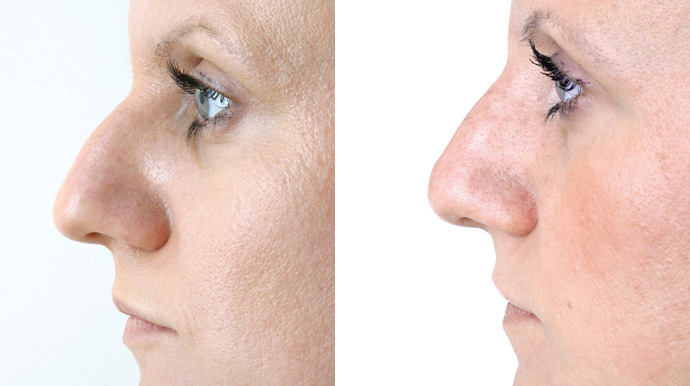 The non surgical nose shaping procedure takes only 10-15 minutes and the results are instantaneous. We use modern nose fillers which contain some local anesthetic in them, and this coupled with our light handed technique, this procedure is quick, easy and painless. As we do not move the nose too much, the results can last as long as 12-18 months, and with repeat treatments, they can last even longer. Since the manufacturer Q-MED, launched Restylane in 1996, it is estimated that over 9 million non surgical nose shaping treatments in over 70 countries have been carried out worldwide. Restylane Perlane, which is used in this procedure, is a biocompatible and biodegradable product which means that it is not harmful to the body and is broken down and removed from the body naturally. The hyaluronic acid nose fillers come in the form of a sterile gel produced in the laboratory. The advantages of these modern fillers include that they are non-permanent, unlike the surgical alternative. Some injection-related side effects can occur including redness, tenderness, swelling and bruising and none of these are ever very serious and they will resolve in a matter of days. We will assess every patient thoroughly before deciding whether they are suitable for this non-surgical procedure. Many patients who previously thought that their only alternative was surgery, are pleasantly surprised when they are told that this quick and simple procedure can solve their problem. However, there are still some patients who would not be suitable for this non surgical nose job procedure and who would still have to have surgery. I have always had a complex about the shape of my nose and always cringed when I would see photographs of my profile and it’s “hooked” nature. I have therefore been considering a surgical rhinoplasty for a long time , but the cost and fear of the operation have been stopping me. I was therefore intrigued when I heard of these non-surgical nose shaping procedures with Restylane. When I met Dr Milojevic, he put me at total ease and explained that this was a quick and painless procedure with no serious side effects. He used a new type of Restylane with local anaesthetic, and the procedure was indeed painless. Apart from some swelling for a few days, I had no other side-effects afterwards. Now, 1 month later, I have a beautiful new nose! I must say that not in my wildest dreams did I think that the results Dr Milojevic achieved were possible. I have a gorgeous profile and a straight nose. I couldn’t stop looking at photographs of me from a recent wedding. What is amazing, and I don’t know how this is possible, is that my nose looks smaller! It’s like magic!